ICYMI: The pace and extent of global activism against fossil fuel pipelines isn't just heating up — it’s on fire. Thousands gather in Metro Vancouver, British Columbia, for Indigenous-led "Protect the Inlet" mass mobilization against the Kinder Morgan Trans Mountain Expansion pipeline. Over the past few months, the movement against oil pipelines has been gaining overwhelming momentum and is showing little sign of slowing down. As activists put their bodies on the line — from those who peacefully blocked the Canadian High Commission in London, to the over 10,000 people who marched in solidarity with Indigenous peoples’ resistance in Coast Salish territory — we are witnessing a united movement to stop oil companies from putting water at risk, fueling climate change and violating Indigenous rights with their destructive pipelines. With thousands of activists speaking out all across the globe, the message is abundantly clear to the fossil fuel industry and those who back it: we won’t stop until you do. Take a look at some of the incredible actions and activists that have been pushing back against new pipeline construction from Kinder Morgan and others, as well as the banks that continue to fund this work. The bravery and resolve of the many activists standing up for their communities and the environment is incredible. Here are some of the most powerful moments that continue to inspire more and more people to push back against corporations who put profits over people. These pipelines will not be built. 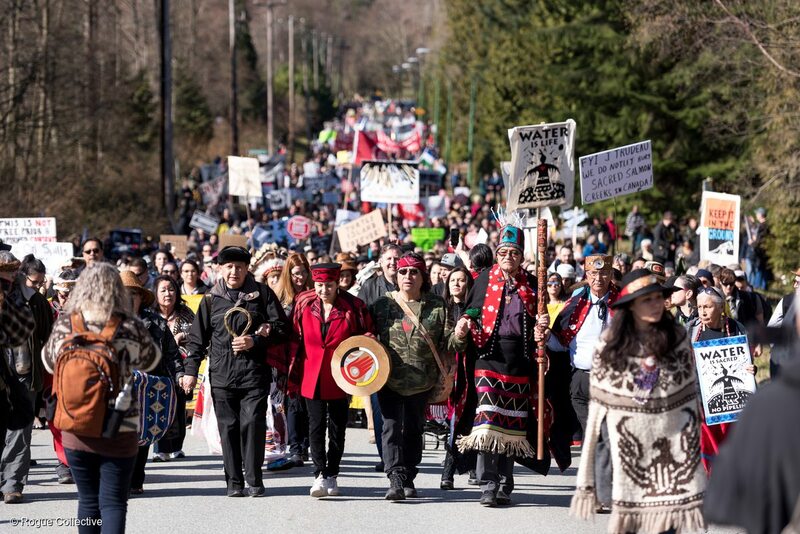 Indigenous leaders and over 10,000 thousand people in British Columbia mobilized together for Kwekwecnewtxw — Protect the Inlet — a historic stand to stop the expansion of the Kinder Morgan Trans Mountain tar sands pipeline. The mobilization, led by Tsleil-Waututh spiritual and cultural leaders, included building a “watch house”, based in the culture of the Coast Salish peoples, who used watch houses to monitor their enemies and prepare to defend themselves in case of attack. Amazing. Thousands and thousands of people coming together from coast to coast to coast to protect the land and water and stop a pipeline that would endanger them both. 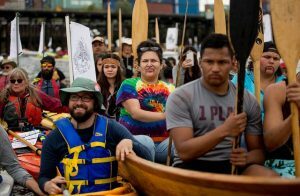 A flotilla of about 30 kayaktivists from the group Mosquito Fleet took to the waters of Seattle’s Elliott Bay, calling for better safety regulations of oil barges in the Salish Sea and to block the Kinder Morgan’s Puget Sound oil pipeline from going through Washington state. Mosquito Fleet called attention to the threat posed by Kinder Morgan Trans Mountain project which could result in a 700% increase in oil tanker traffic through the Salish Sea to refiners in Washington state, California and overseas. Nearly 200 people were arrested for peaceful, non-violent direct action by blockading numerous entrances of the Kinder Morgan Westridge marine terminal. Paddlers attached themselves to the two gates of the pipeline company’s floating razor wire fence that surrounds the construction site, preventing workers from entering by water. At the same time, others on land, including 2 members of Canada’s Parliament, Greenpeace founder Rex Weyler, and a former Trans Mountain employee Romilly Cavanaugh, blocked the two land-side gates and prevented workers from using any entrance. 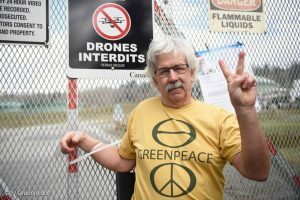 Greenpeace International founder Rex Weyler stands in solidarity with Indigenous Peoples to stop a new Kinder Morgan pipeline from being built. They joined indigenous activists, senior citizens and other activists to block the gates to Kinder Morgan’s construction site on Burnaby Mountain in British Columbia. In solidarity with Coast Salish communities, they aim to show the world that Canada is going down the wrong path on climate and on reconciliation with Indigenous Nations in building this pipeline. Romilly Cavanaugh, former Trans Mountain* environmental engineer arrested Tuesday:“I worked for Trans Mountain’s environmental department in the 1990s. If there is a tanker spill or spill from the pipeline itself, from Edmonton to Vancouver and down to Washington, the best Trans Mountain will be able to do, even today, is between 10 and 20% recovery.The rest will remain in the environment, damaging fish, birds, crabs – everything you can imagine. 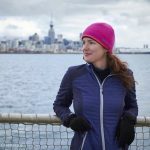 We lived and worked in fear when I worked for Trans Mountain, because the reality is that no amount of equipment or people is going to change the fact that in the event of a spill, they will be able to recover very little.”*Trans Mountain owned the pipeline until Kinder Morgan bought it in 2005. 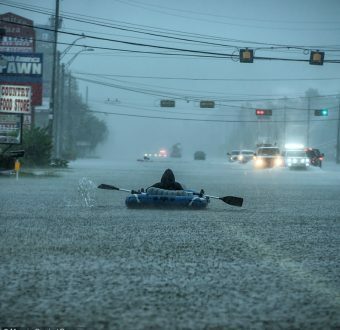 The pipeline is more than 60 years old and urgently needs replacement. The new pipeline will be new pipe for 950 of the total 1,050 kilometres – making a mockery of the euphemism "expansion". Kinder Morgan announced it is suspending work on all non-essential activities around the Trans Mountain Pipeline Expansion, in a reaction to the widespread opposition to the project. Score one for people power. Yet the battle is far from over — Kinder Morgan has set a May 31st deadline to decide if it will continue on with the project, and the Canadian government is determined to see it built. A massive protest pipeline was installed by 30 Greenpeace volunteers around the entrance to the Canadian High Commission in Trafalgar Square, London. The building was blocked by climate campaigners who built a “Crudeau Oil” pipeline to protest the Trudeau government’s continued efforts to bring tar sands pipelines from the Alberta tar sands across Indigenous lands. The action came as Canadian PM Justin Trudeau touched down in London to attend the Commonwealth Heads of Government meeting — ironically, he was there to trumpet the importance of action on climate change. 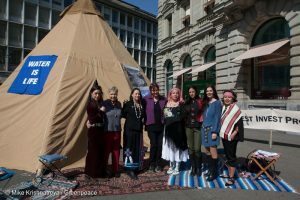 The Indigenous Women’s Divestment Delegation, organized by the Women’s Earth and Climate Action Network (WECAN), traveled to the heart of Switzerland’s financial district to demand that Swiss banks stop financing pipeline companies. They represent Indigenous Peoples from the Tsleil-Waututh Nation, the Oglala Lakota, and Mdewakantonwan Dakota, the Diné/Navajo, the Standing Rock Sioux Tribe and Louisiana’s United Houma Nation. Activists set up a tepee on the Paradeplatz in Zurich. Swiss senior women for climate protection receive the «Indigenous Women’s Divestment Delegation To Europe», organized by the «Women’s Earth and Climate Action Network (WECAN) ». Together they protested against the climate-damaging commitment of Credit Suisse and UBS. Ocean Hyland from the Tsleil-Waututh Nation traveled over 4000 miles to ask a simple question to the Chair and the Board at the Barclays Annual General Meeting — why are they still funding destructive pipelines? Her work is part of a larger campaign against the Kinder Morgan pipeline expansion. At the meeting, the room broke into applause after her question, while the board chair struggled to answer her. The board eventually agreed that they would be reviewing their position on the issue later in the year. Ocean Hyland is from the Tsleil Waututh Nation in Canada. Today she called on @Barclays to stop funding climate wrecking pipelines. In the early afternoon of May 1st, over a dozen water protectors from the L’eau est La Vie resistance camp in Louisiana shut down construction at two different sites of the Bayou Bridge Pipeline — ones owned by Energy Transfer Partners (ETP), who are currently pursuing a bullying lawsuit to shut down the opposition. The water protectors held work off from happening and stayed in ceremony for several hours at the second location until all of the workers left the site and went home. The following morning, a group of water protectors from the L’eau Est La Vie Resistance Camp stopped 12 trucks with 40+ workers from welding pipe together for the entire morning. Activists from many allied groups shut down 2nd Ave in Seattle to protest tar sands pipeline financing, including representatives from the Missing and Murdered Indigenous Women of Washington State who occupied the lobby of the Russell Investments Center. These activists called on JPMorgan Chase’s PNW Chairwoman Phyllis Campbell to come to the lobby and talk with speak with them about Chase’s investments in Canadian tar sands, including the Kinder Morgan Trans Mountain pipeline. 4 tarpees deployed outside, shutting down 2nd Avenue in downtown Seattle. 5 indigenous & 15 non-indigenous women occupying the Chase bank at the location of senior regional mgmt., awaiting a meeting. Local kayaktivists from the Coast Salish territories shutdown the Kinder Morgan Burnaby Marine Terminal with two protectors blocking the water entrance, while others on land blocked the two land-side gates. Work was suspended and the workers were turned away. Hundreds of people marched through Downtown Vancouver, stopping at each bank along the route that is backing the Kinder Morgan Trans Mountain pipeline project. A delegation representing Indigenous and nonindigenous communities from Canada to Ecuador and across the U.S. gathered at Chase’s annual shareholder meeting in Plano, Texas.The delegation represented powerful leaders standing up to new fossil fuel infrastructure projects in their communities — projects which threaten Indigenous sovereignty, human rights, community health, water, and the climate. 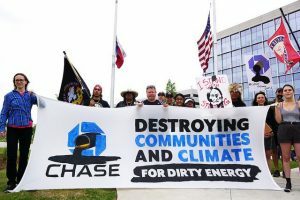 Among major U.S. banks, JPMorgan Chase is the biggest funder of extreme fossil fuels, and the protest called for an end to funding of some of the most carbon-intensive, financially risky, and environmentally destructive sectors. 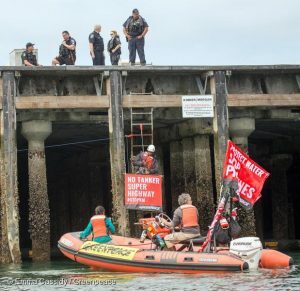 Greenpeace USA and Mosquito Fleet activists blocked an oil barge from entering Kinder Morgan’s Seattle facility by locking themselves to the pier. In addition to the blockade, local kayaktivists next to the facility have deployed a massive water banner that reads “NOT THEN” with a Shell Oil logo, and “NOT NOW,” with the Trans Mountain logo. Greenpeace and Mosquito Fleet activists block a Kinder Morgan barge from entering the company’s Seattle facility by locking themselves to the pier and displaying banners. The action came only two weeks before Kinder Morgan will determine if it will continue with its Trans Mountain expansion project and against the backdrop of overwhelming momentum for the Indigenous-led movement against pipelines. Kinder Morgan and other companies like TransCanada and Energy Transfer Partners continue to face protests, negative press, delays, and lawsuits. Activists from across Washington and Oregon took action by land and sea to protect our waters, our communities, and our climate from Kinder Morgan’s Trans Mountain Pipeline expansion. A rally and march on land and a flotilla of kayaks and canoes swarmed Kinder Morgan’s marine terminal from the water. Participating organizations in the Stop Kinder Morgan Action Council included 350 Seattle, 350 Tacoma, Mosquito Fleet, Protectors of the Salish Sea, Students for the Salish Sea, Greenpeace USA, Sierra Club Washington Chapter, and Stand.earth.